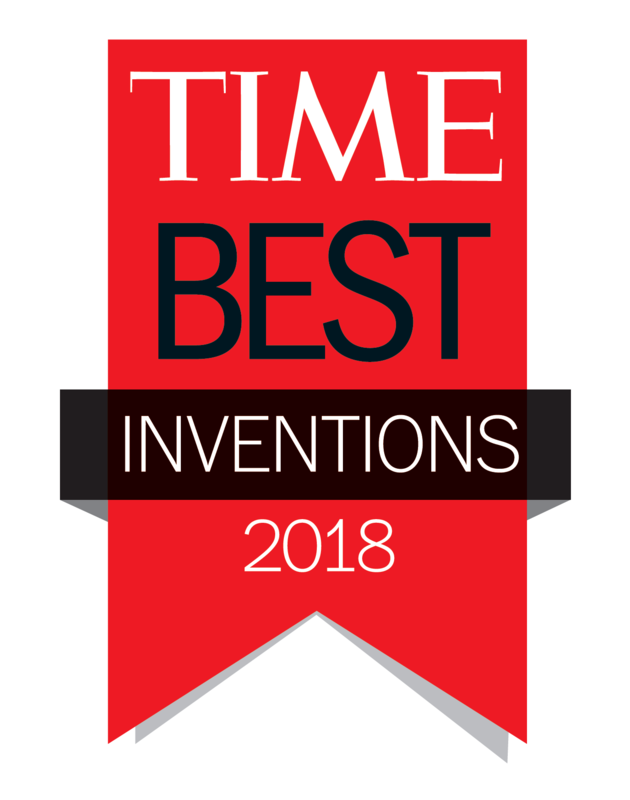 Learn more about ACUVUE® OASYS with Transitions™ – one of TIME’s Best Inventions of 2018. Learn more about this breakthrough contact lens experience and the technology it was built on, so you can answer your patients’ questions with confidence. Log in or register for JNJVISIONPRO.CA to access this online course. Now that ACUVUE® OASYS with Transitions™ has arrived, it’s time to start the conversation with patients about the impact bright light can have on vision. These articles will help enhance your understanding of how changing and challenging light conditions impact your patients’ visual experience and satisfaction. Now that ACUVUE® OASYS with Transitions™ is available, your patients are going to want to learn more about this breakthrough contact lens experience. Here are three of the most commonly asked questions. You can download more FAQs to share with your office below. Q: How will the lenses look on my eye? A: ACUVUE® OASYS with Transitions™ was specifically designed to provide patient benefitsᵻ, while minimizing the change to the eyes' appearance2. Q: How quickly do they change? A: The lenses begin to darken immediately, as soon as they are exposed to sunlight. When moving from outdoors to indoors, they quickly fade from dark to clear within 90 seconds2. Q: How should the lenses be stored? A: To help maximize lens performance, lenses should be stored away from direct sunlight when not in use. 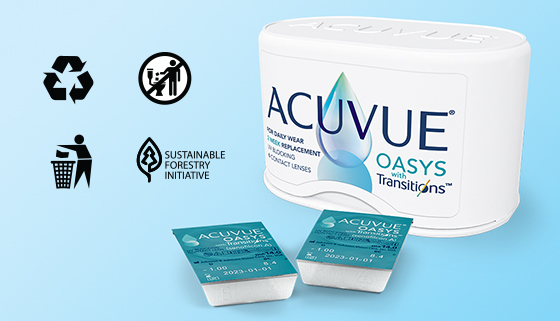 The ACUVUE® OASYS with Transitions™ outer case is made using 90 percent pre-consumer recycled content. We took waste from our own manufacturing processes to create the outer package. After use, the case can be recycled in many cities in Canada. Check local collection rules for #5 plastic recycling. Use #SquintLessSeeMore on your social channels to let your patients know about ACUVUE® OASYS with Transitions™. ** By helping your vision recover from bright light faster and reducing squinting, compared to the leading reusable contact lens. 1 FDA press release: FDA clears first contact lens with light-adaptive technology https://www.fda.gov/newsevents/newsroom/pressannouncements/ucm604263.htm, April 10th 2018. 5 JJV Data on File 2018. Substantiation for Bothersome Light Need Prevalence. β Helps protect against transmission of harmful UV radiation to the cornea and into the eye. ^WARNING: UV-absorbing contact lenses are NOT substitutes for protective UV-absorbing eyewear such as UV-absorbing goggles or sunglasses because they do not completely cover the eye and surrounding area. You should continue to use UV-absorbing eyewear as directed. NOTE: Long-term exposure to UV radiation is one of the risk factors associated with cataracts. Exposure is based on several factors such as environmental conditions (altitude, geography, cloud cover) and personal factors (extent and nature of outdoor activities). UV-blocking contact lenses help provide protection against harmful UV radiation. However, clinical studies have not been done to demonstrate that wearing UV-blocking contact lenses reduces the risk of developing cataracts or other eye disorders. These lenses are not a replacement for sunglasses. IMPORTANT SAFETY INFORMATION: ACUVUE® Brand Contact Lenses are indicated for vision correction. As with any contact lens, eye problems, including corneal ulcers, can develop. Some wearers may experience mild irritation, itching or discomfort. Lenses should not be prescribed if patients have any eye infection, or experience eye discomfort, excessive tearing, vision changes, redness or other eye problems. Consult the package insert for complete information. Complete information is also available from Johnson & Johnson Vision Care division of Johnson & Johnson Inc., by calling 1-800-267-5098 or by visiting jnjvisionpro.ca. © 2018 Time Inc. Used under license.